One of the fundamentals of enjoying Scotch whisky is learning how to taste it properly. However, it is not necessarily a skill that comes naturally. After all, there’s more to a dram than just knocking it back. You can use the links above to jump ahead or scroll down to read it all! I now truly enjoy whisky. At first I was a little weary but now I have learned to appreciate whisky with this guide. Whisky Tasting Guide Reviewed by Charlie R. on April 30th . Pour the desired amount into your glassware of choice. Vigorously swirl the dram to release aroma. “Nose” your whisky by placing your nose deep inside the glass and drawing in deeply. Repeat steps 3 & 4 until you have a total of three nosings. Take a sip and “chew” the whisky around, getting across your entire palate. Draw in a breath of air, experiencing the remnants of flavor as they cross your palate with a cool breeze. Want to develop your knowledge and learn all the details? Keep scrolling to read more! 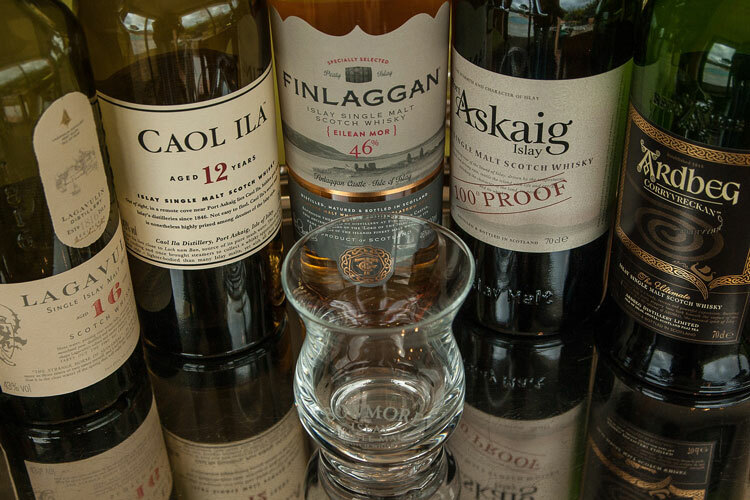 Knowing how to pour, store, and enjoy a single-malt is only part of the equation. To maximize your enjoyment, we highly recommend having a clean palate with which to draw out each ounce of flavor. After all, “sip and enjoy” is tough to attain when you are still tasting your luncheon meal. The basic palate cleansing is a drink of water prior to your whisky as it will wash away any impurities in your mouth. It is also recommended to partake in light meals, avoiding heavy garlic, onions, or spice, prior to imbibing. Whisky Editor Robert Raymond’s ultimate recommendation is to avoid liquids with lots of sugar or roasty flavors, such as soda or coffee, as these tend to invade the tongue for extended periods. Keep in mind that when we say palate cleansing we do not mean this in the literal sense of cleaning so do not grab your toothbrush or mouthwash. Doing so will have the opposite effect and leave you with a minty fresh but effectively useless palate for a short while. Before your first sip, you should hold the glass of whisky up to the light. At this point, you should look at both the color and the so-called “legs”. Not the feeling you get after a few nips! Legs refers to the way the whisky runs down your glass. It often indicates age and quality of a dram. Hold your glass at a 45-degree angle and roll it around so the whisky coats the glass walls. Stand the glass up and watch how the whisky runs down. You are looking for the viscous, syrupy run of your dram. If the whisky runs quickly, it often indicates a light, possibly young, expression. A slow, oily crawl back to bottom is usually a sign of older whisky. A crucial part of the whisky ritual is getting acquainted with every aroma prior to taking your first sip. This is called, nosing. The proper way to nose your glass is not to wave it under your nostrils but insert your nose into the glass as far as you can. You vigorously swirl the glass, then slowly and steadily inhale to take in the aromas. Close your eyes and envision the fruit, plant, mineral, earth, wood, and other scents which make up this expression. It will magnify your ability to taste them. We prescribe to the legendary Richard Paterson’s (master blender of Whyte & Mackay) method: saying hello to your dram thrice over. [sniff] Quite Well, Thank You Very Much. As you will recall from biology class, we are able to detect 32 base aromas contrasted to only 4 master flavors. So it makes sense that aroma would be the biggest indicator of how we perceive flavor. Cereal: Comes from the malted barley used in a particular expression. Fruit (ester): Sweet, fruity scents, characterized best in Speyside Whisky. Floral (aldehydic): Grass, leaf, bush, or hay best characterized in Lowland Whisky. Peat (phenolic): Islay Whisky in a nutshell, the tar, iodine, and acidic phenols come from kilning of the grain. Feint: Consider this the umami of the whisky world, hard to describe nuances, feints are are part of the actual distillation and can range from toasted biscuit to tabacco and honey. They characterize the physical still as well as the skillset of the distiller. Sulfer: Generally too acrid to enjoy, the use of copper in distillation is meant to filter this out. Though a touch of sulfer can add to the tasting experience. Wood: Any time you taste vanilla, it is usually because of American White Oak. If left too long in the cask a whisky can develop a pure wood scent. Wine (extractives): Extractives are just as they sound, essence leached from ageing in a barrel previously filled with wine (often sherry or port). This includes tanins, fruit particulate, and other residues. After nosing your dram and becoming familiar with what this expression is promising, take a sip. Chew it around in your mouth and move it across your palate; hit the top, front, rear–every place where you find something new to taste. Whether tasting with the family, the Bespoke Unit team, or solo, Whisky editor Robert Raymond likes to verbalize what he is smelling and tasting (if solo, he allegedly just says it in his head). For him, this helps to amplify the experience. It also can start some great conversations when sharing a dram amongst friends. After you swallow it, take in a mouthful of air. The lingering flavor will pass over your tongue with a cool breeze. Whisky reviews are often dripping with metaphor. As you can imagine, using only 8 master scents and 4 master flavors can lead to dull reading. So, the best reviews of an expression are usually those which paint a picture of what the taster experienced, versus a scientific recount of the number of phenols he tasted. When they cracked a bottle to try it, they could find all of these flavors, albeit not desirable ones. So, you should go out, get yourself a dram, and taste it. Then read a detailed review from another enthusiast and see if you can identify the flavors described. You can discover our own whisky reviews too! Sat in a cottage on the Isle of Mull, with a log fire and two springer spaniels for company. A trip to Tobermory distillery has presented me with a 10 year old Tobermory, a 17 year old madiera finished Tobermory, a 18 year old Olorosso finished Ladaig, a 20 year old Muscatel finished Ledaig, and a 15 year old Rioja finished Ledaig. I’m rather content. Ah, a man of distinction! I’m jealous as I was absolutely smitten by Mull when I visited it last summer. Probably my favourite of the Hebrides. I also made sure to visit Tobermory distillery. It’s among my favourites and I even took the time to right a full brand overview of their history as well as a review of the Ledaig 18-Year Old Olorosso!